Puerto Rico’s nearly decade-long economic recession has led to people leaving the island for the mainland in numbers not seen in more than 50 years, new Pew Research Center analysis of Census Bureau data has found. Last year, 84,000 people left Puerto Rico for the U.S. mainland, a 38% increase from 2010, according to the analysis of American Community Survey data. 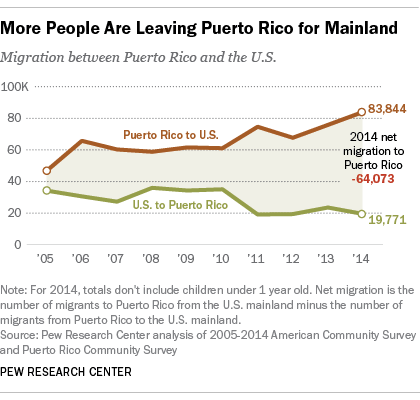 At the same time, the number of people moving to Puerto Rico from the U.S. mainland declined, resulting in Puerto Rico having a net population loss to the mainland of 64,000 in 2014, more than double the net loss of 26,000 in 2010. The island’s declining population is not a new trend. Indeed, Puerto Rico has been experiencing a net population loss since at least 2005, a year before its recession began. However, the trend has been accelerating since 2010 as the U.S. mainland’s economy has rebounded from the Great Recession even as the island’s economy has remained mired in a recession. More recently, the Puerto Rican government has seen its tax revenues decline and, barred by U.S. law from filing for bankruptcy, it may run out of cash in November. The continued loss of people, particularly school-aged children and those in their prime working age, has only worsened the island’s economic situation and outlook. Public opinion surveys show Puerto Ricans are not confident in their economy’s future. A Gallup poll conducted in December found that just 6% of Puerto Rican residents thought economic conditions on the island were getting better, a far lower share than the 41% of adults in U.S. states who said the same about the country as a whole. Among Latin American countries, only Venezuela (7%) rivaled Puerto Rico in economic pessimism. A Pew Research Center survey of Latin American countries conducted in 2013-14 found that in Puerto Rico, 89% were dissatisfied with the way things were going on the island. As of 2013, there were more Puerto Ricans living in the U.S. mainland (5.1 million) than on the island itself (3.5 million). This is a result of not just outmigration from the island but also declining fertility rates – the average woman in Puerto Rico was estimated to have 1.3 children during her lifetime in 2013, down from 1.9 in 2005. The island’s population isn’t expected to rebound anytime soon. The Census Bureau projects the population of Puerto Rico will continue to shrink, falling to 3 million by 2050.